As I was leaving Issaquah, WA last week, my 3yr. old told me he was not ready for me to drive yet. Since it was still rather early in the morning I knew that meant he would not fall asleep for the three hour ride home, which would lead to a rather unpleasant drive for all present in the car. Sooooo, what better place to go to kill time than Target! I didn’t actually want to spend any money in the long run, so I just looked for things that I could get free both now and eventually. -(5) $1/1 Johnson’s baby item 5/10 SS? Total OOP: $2.14 and I mailed in a rebate ( 5/10 SS) to receive the full purchase price of the Windex. 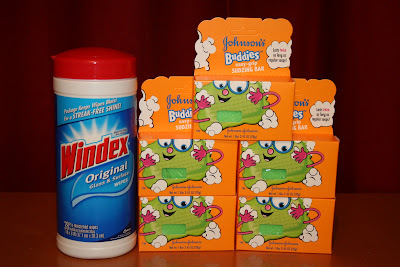 Since I received $.15 overage from the Buddies and had a Windex coupon I will make a small profit after the cost of the stamp. After rebate: Free with $.15 overage!